ajgmets.net: Mets 3 Stars from "Adieu Canada" WIN !! 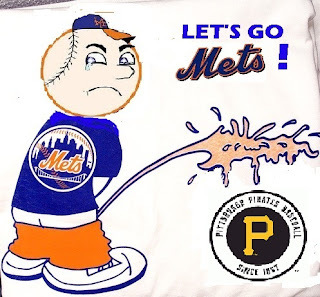 Mets 3 Stars from "Adieu Canada" WIN !! David Wright continued his terrific 2012 start by backing Dillon Gee's fine effort with a pair of hits including a 2 run double in the first. Mike Baxter chipped in with 3 hits as the Mets finished the first portion of the 2012 interleague nonsense before heading to Pittsburgh for a series with the Bucs starting tonight. Meanwhile in California the Cardinals continued their awful west coast road swing by getting swept by the Dodgers as for some reason lefty relief specialist Mark Rzepczynski was allowed to pitch to St. Louis local boy and right handed hitting rookie Scott Van Slyke with runners on first and second with 2 outs in the 7th inning. Andy Van Slyke's son deposited the lefty's 4th pitch to him into the left field seats erasing a 5-3 Cards lead and denying Kyle Lohse an opportunity for his 6th win of the year. Jared "Skip" Schumaker led the St. Louis offense, which may find itself without first baseman Lance Berkman for quite awhile if a Monday MRI reveals what is feared to be a torn right ACL, with a 2 run triple. Shortstop Rafael Furcal continued his hot start with a pair of hits and 2 RBI while rookie first sacker Matt Adams (called up to replace the disabled Berkman) added his first 2 MLB hits in the losing cause. 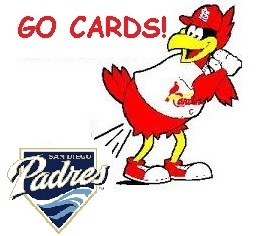 The Cards return home to start a homestand with the Padres on Monday night.